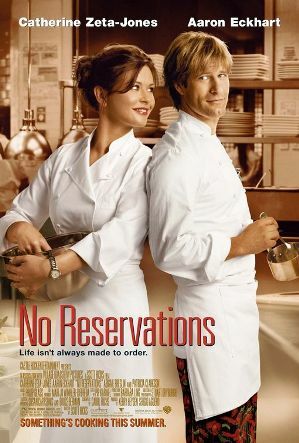 I had my reservations about “No Reservations,” after seeing one of the cheesiest trailers in recent memory. As if we needed yet another movie about a single, self-absorbed person who gets a kid and has to deal with “changing their life.” As it turns out, the movie isn’t horrible or anything, it’s just not anything new, either. Every line, every scene, everything down to the musical score seems wholly generic, like it was plucked from the same bin as other romantic comedies about someone going through a life changing experience. The film takes this simple (and very derivative) premise and uses it to put the three main characters in a series of predictable and boring situations, many meant for humor value. Sadly, most of the attempted jokes fall flat and make the film seem downright cheesy in these parts. The situations that are meant for emotion fall just as flat—for instance, there’s a scene near the end where the little girl, Zoe, runs away, and while this supposed to be a sort of climax, it’s laughable because if you’ve watched the rest of the movie, you can easily guess where she’s going (I won’t spoil it for those who want to guess for themselves). If they had taken the time to figure out some interesting and unexpected plot threads, the film would have been much more enjoyable. The film does have a few strong points though. Aaron Eckhart plays Kate’s rival and romance, Nick, and shines in the role. He’s charming, funny, and as always, has a great screen premise. His performance is fun to watch, but feels out of place in a movie where everything else is so low-key. On the other performances, Abigail Breslin, the Oscar-nominated 6-year-old known for her role in Little Miss Sunshine, does a fine job in the role of Zoe. She’s a good little actress, and this is the perfect type of role for her. Catherine Zeta-Jones does the uptight thing yet again, and is perfectly suited for her role as Kate. Her performance isn’t mind-blowing or anything, but it serves the film well enough. There’s really not much more to say about the movie. Everything about it is just very, very generic, even down to the uninspired musical score. There’s nothing necessarily bad about it, but there’s nothing really great about it either. This is the kind of movie I can imagine lonely single people ordering off Pay-Per-View on a weekend, because it’s just something to pass the time. It’s not a bad way to spend 2 hours, but it’s not a horribly interesting way to either.